In a story we could only call “Patty Thing,” Squidward is pursued by a shambling terror made of discarded Krabby Patties--featuring a krusty creature drawn by the horrifying Stephen R. Bissette (Swamp Thing, Tyrant)! Then in “Monster Canyon,” SpongeBob must make a Krabby Patty delivery to an address from which no delivery boy has ever returned! 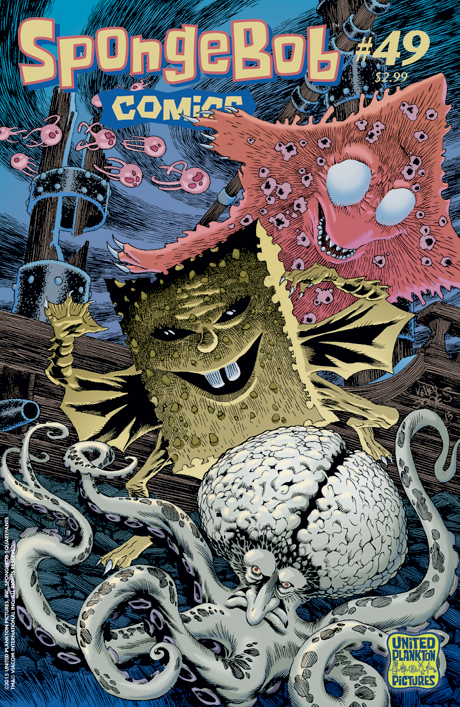 PLUS: Sandy makes a costume; a monstrous episode of James Kochalka's “SpongeFunnies”; a scary “Flotsam and Jetsam”; and several creepy under-the-sea pinups!